I’m currently working as a helicopter transfer practitioner and critical care practitioner for the Emergency Medical Retrieval Transfer Service and Wales Air Ambulance Charity. 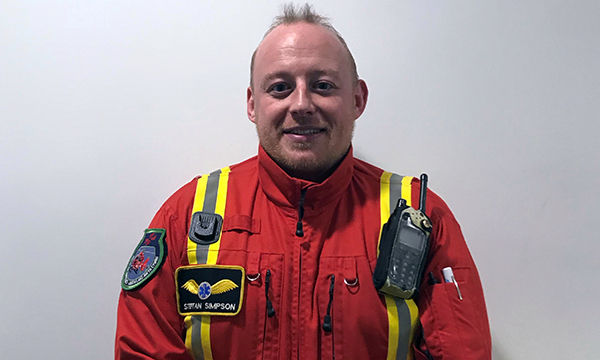 My work incorporates two roles, providing pre-hospital critical care and providing specialist retrieval and transfer medicine with neonatal and paediatric critical care teams on the Children’s Wales Air Ambulance. Why did you become an emergency nurse? Throughout my nurse training I always felt drawn to emergency care; the feeling of not knowing what would come through the door next appealed to me and I always felt that I worked well under pressure. My exposure to emergency medicine as a nursing student at Swansea University was everything I’d hoped it would be and more. How and where have you developed your emergency skills? I’ve been working in emergency medicine for the past 16 years. My career started at Singleton Hospital casualty department and I then moved across Swansea to the emergency department at Morriston Hospital. After four years, I returned to Cardiff, my home town, as a charge nurse at the emergency unit at the University Hospital of Wales (UHW). At UHW I became an emergency nurse practitioner and gained experience in all aspects of emergency nursing. What have you learned to date? Be humble. No matter where you are in your career there’s always someone who knows a lot more than you. Listen to your colleagues, patients and their families. Always keep an eye out for your colleagues, try to recognise when people are having a bad day and support them as much as possible. As a helicopter transfer practitioner, I transfer and retrieve patients from all over the UK, visiting different hospitals and specialist centres. Transferring a child when they’re poorly to a specialist centre and then retrieving them once their health has improved is very rewarding. Sometimes just getting them nearer to home is a visible relief for them and their families. What is your greatest challenge in your job? I was used to providing critical care in hospital but have found transferring these skills to the pre-hospital environment very challenging indeed. Although the process is the same, the environment can vary from patients trapped in vehicles, quarries, fields or on hillsides. What achievement makes you most proud? Being a finalist in the RCNi Nurse Awards 2018 was my proudest professional moment. Along with Emily Jones, a paediatric emergency unit sister and Rhian Burke, founder of a children’s bereavement charity 2 Wish Upon a Star, we developed a pathway for the referral of bereaved relatives of children and young people up to 25 years who die suddenly in the paediatric emergency unit. I’ve always felt that bereaved families, in particular those of children and young adults, left the department in the most vulnerable states – and there were several families that I thought of in the days after a sudden death. What is likely to affect emergency nurses most over the next 12 months? Meeting other finalists at the RCNi Nurse Awards made me realise that nursing is constantly striving to improve the patient experience and outcomes despite being under huge amounts of pressure. Whatever the next 12 months brings, our profession will move with the demands of our patients to give everyone the best care possible.